Tired of slow connection speed and losing wi-fi signal within your home? Ring out that old router — ring in Google’s Wi-Fi System. Despite all the hype about internet technology, the truth is that we all have one or more spots in our homes where the wi-fi signal is slow, weak and inefficient. This problem arises because routers generally have limited coverage range and adding extenders reduce the internet speed and quality. When using the internet, you are therefore limited to that area of your home where the signal is full and better, and this is inconvenient and frustrating. Well, thanks to Google Wi-Fi System all that can change. It is a wi-fi system that connects to your modem, placing your current router to provide fast, uninterrupted wi-fi coverage throughout your home. This device eradicates buffering and dead zones within your home. Measuring 4.2 x 4.2 x 2.7 inches and weighing 11.8 ounces, the round, plastic, white wi-fi device fits well into your home décor. It features a 512MB Ram, 4GB eMMC, and a Quad-core ARM CPU. The Google WiFi System operates using mesh Wi-Fi technology. In a WiFi mesh network, routers are connected by Wi-Fi and merged into a single interface. Each wi-fi unit covers from 500 to 1,500 square feet. The number of units you need would depend on what areas in your home require wi-fi provision and the size of your home. Two wi-fi packs cover 1,500 – 3,000 square feet while three covers 3,000 – 4,500 square feet. You can have up to six Google Wi-fi units installed within your home, covering up to 9,000 square feet. Adding more units does not diminish the quality and speed of your internet service. The Google WiFi System is compatible with most internet service such as Verizon Fios, Time Warner, and Comcast. 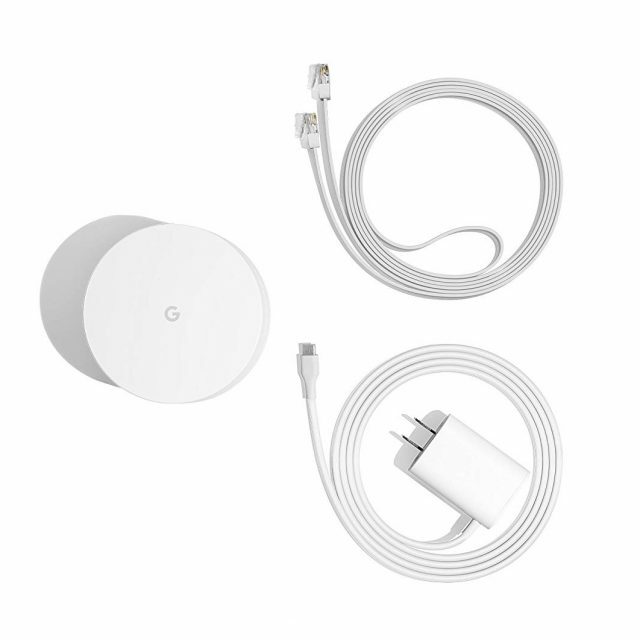 It comes in a box with the Google Wi-Fi- point, 15W power adapter, 11.9 Ethernet cable, and a Quick Starter Guide. 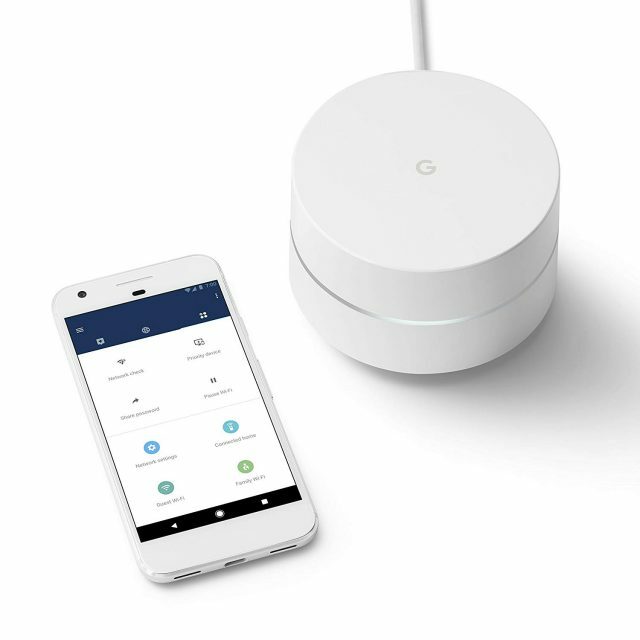 Installation and Setup: You need a Google account, broadband internet connection, modem, Google Wi-Fi app, and an Android device (4.0+) or iOS device (8.0+) to install your Google Wi-Fi system. Download and install the Google Wi-Fi app to your phone device. Connect your modem to the device using the Ethernet cable provided. Next, connect the power adapter to the device and plug it into your electrical socket. The phone app detects your wi-fi and gives you further instruction to set up the device. 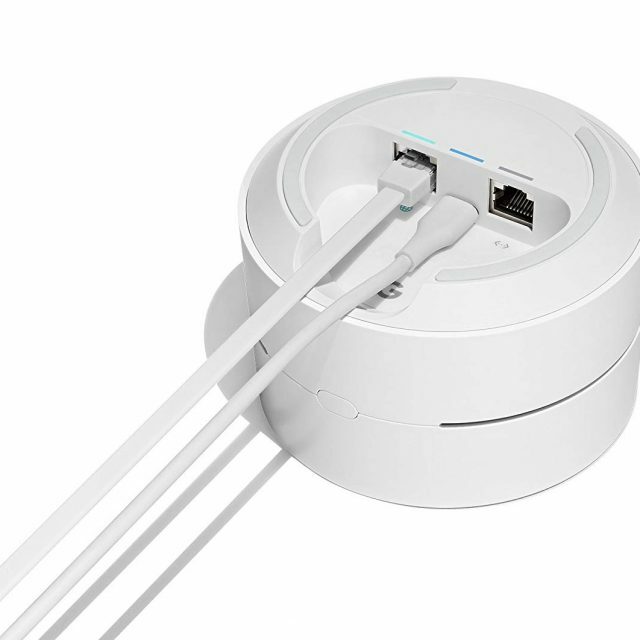 Connectivity: Each Wi-Fi point has two Gigabit Ethernet ports. On the primary wi-fi point (i.e., the point that connects to your modem), one of the ports serves as a WAN and the second as a LAN. Both ports on additional Wi-Fi units serve as LAN port. 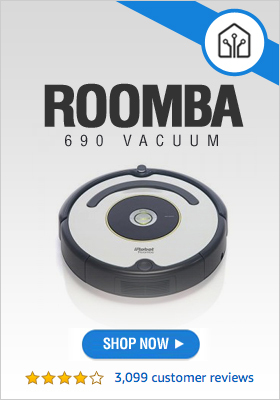 It features a concurrent dual-band Wi-Fi that supports IEEE 802.11a/b/g/n/ac protocol. Network Assist Technology: This incredible feature relieves you of having to manage your network by yourself. It does all the work for you by selecting the fastest wi-fi band for your connected devices, placing newly connected devices on the least congested channel, and connecting devices to the fastest wi-fi point. App Control: The Google wi-fi app allows you to control and monitor your wi-fi network and connected devices. You can share your password with guest users, view connected devices and prioritize them. You can also pause wi-fi at specific times of the day, or on any of the connected devices, like on kids’ devices at dinner time or bedtime. 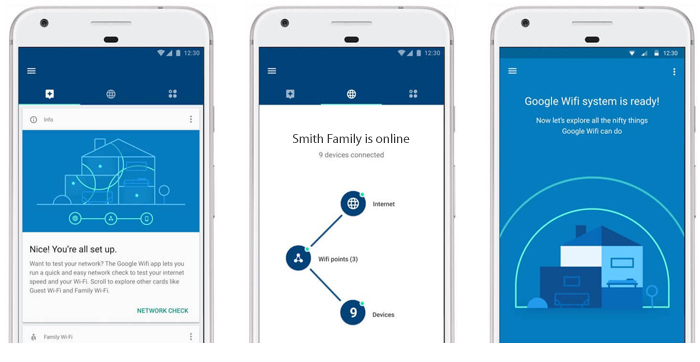 The Family Control feature in the app also allows you to set and restrict browsing as appropriate for your kids’ devices or all devices in your network. Automatic Updates: Immediately after installing and setting up the Google Wi-fi system, the phone app checks, and automatically downloads the latest security measures and updates. After that, the system periodically checks for updates, downloads and installs them to keep the device up to date. Network Testing: If you are worried about your connection speed, you can carry out a network test from the Google Wi-Fi app. Each test takes about thirty seconds, and the result displays your internet download and upload speeds. There is also a brief description of what you can do with the speed rates indicated. To avoid false or incorrect test results, do not carry out tests while your network is busy. In-Built Security Features: The Google Wi-Fi system comes with some state-of-the-art security features to protect your wi-fi network from intruders and hackers. The Firewall sits between your wi-fi network and the internet. It prevents unauthorized access and connections to your data and network. Because it also keeps and tracks of all connections (UDP and TCP), only recognized active links are allowed through the firewall. The password security protocol for the device is WPA2, the most popular and latest wi-fi encryption protocol. Only the correct passphrases are allowed into the network. The device does not support WEP, WPA, and WPS protocols as they are insecure and prone to attacks. TLS, Transport Layer Security, ensures that all communication between Google Wi-Fi and Google, or between the device and any server, is not tampered with and are kept private. 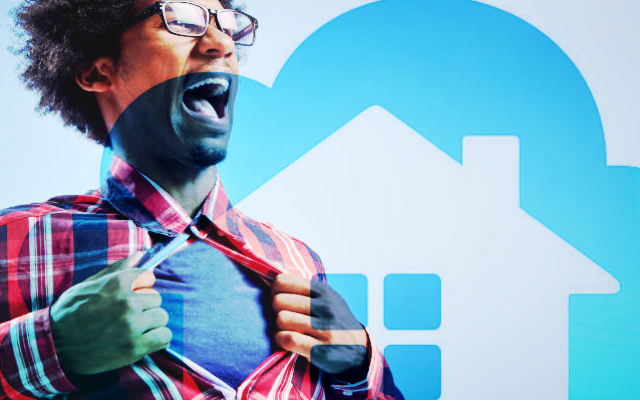 More and more home devices are becoming wi-fi enabled. The coverage area and connection capacity of traditional routers are limited. Building materials or house design may also reduce the effectiveness and coverage of routers. The Google Wi-Fi system replaces your home router and provides you with a more effective, efficient, and fast wi-fi system within your home. It allows an unlimited number of smart home devices to connect to your wi-fi without reducing the speed and efficiency of your network. Coming from Google, it does well what it claims to do, and it is scalable according to your needs. Get Your Google WiFi system Now!